Anderson, Kenneth. 2011. 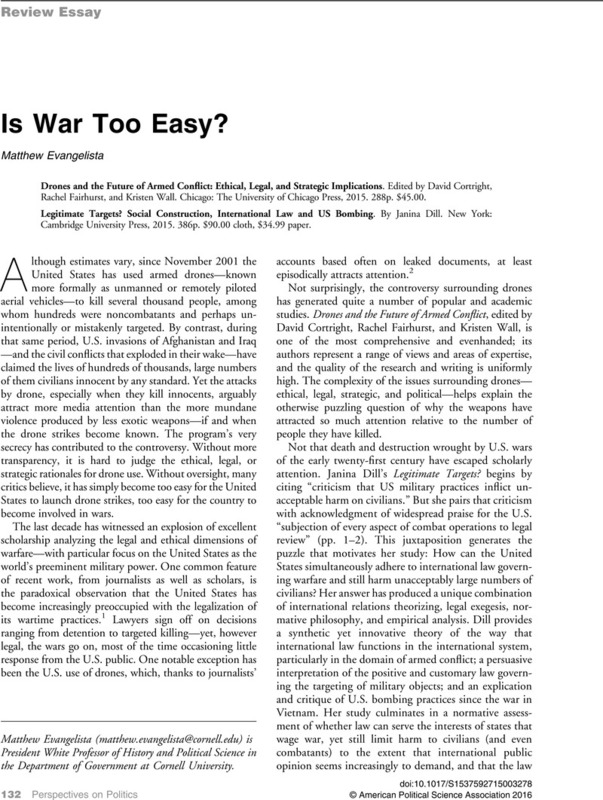 “Targeted Killing and Drone Warfare: How We Came to Debate Whether There Is a ‘Legal Geography of War.’” http://media.hoover.org/sites/default/files/documents/FutureChallenges_Anderson.pdf (accessed October 1, 2015). Anderson, Kenneth. 2013. “Efficiency in Bello and ad Bellum: Making the Use of Force Too Easy?” In Targeted Killings: Law and Morality in an Asymmetrical World, ed Finkelstein, Claire, Ohlin, Jens David, and Altman, Andrew. Oxford: Oxford University Press. Bacevich, Andrew J. 2002. American Empire: The Realities and Consequences of U.S. Diplomacy. Cambridge, MA: Harvard University Press. Bergen, Peter. 2014. “America's Wartime President.” September 29. http://www.cnn.com/2014/09/23/opinion/bergen-obama-wartime-president/index.html (accessed October 1, 2015). Crawford, Neta C. 2013. Accountability for Killing: Moral Responsibility for Collateral Damage in America’s Post-9/11 Wars. New York: Oxford University Press. Klein, Naomi. 2007. “Disaster Capitalism: The New Economy of Catastrophe.” Harper’s, October. Lopez, George. 2013. “Dealing with ‘Enablers’ in Mass Atrocities: A New Human Rights Concept Takes Shape.” http://www.carnegiecouncil.org/publications/ethics_online/0070.html/_res/id=sa_File1/Dealing_with_Enablers_in_Mass_Atrocities.pdf (accessed October 1, 2015). Marks, Susan. 2011. “Human Rights and Root Causes.” Modern Law Review 74 (1): 57–78. Obama, Barack. 2009. “Remarks by the President at the Acceptance of the Nobel Peace Prize.” December 10, 2009. https://www.whitehouse.gov/the-press-office/remarks-president-acceptance-nobel-peace-prize (accessed October 1, 2015). Orford, Anne. 1997. “Locating the International: Military and Monetary Interventions after the Cold War.” Harvard International Law Journal 38 (3). Savage, Charlie. 2015. Power Wars: Inside Obama's Post-9/11 Presidency. Boston: Little, Brown. Scahill, Jeremy. 2015. “The Assassination Complex.” The Intercept. October 15. https://theintercept.com/drone-papers (accessed October 1, 2015). Simpson, Christopher. 1995. The Splendid Blond Beast: Money, Law, and Genocide in the Twentieth Century. Monroe, ME: Common Courage Press.